Eat with your eyes and it’s just chicken and veggies, but take just one bite and you’ll know this is not your everyday chicken dinner. 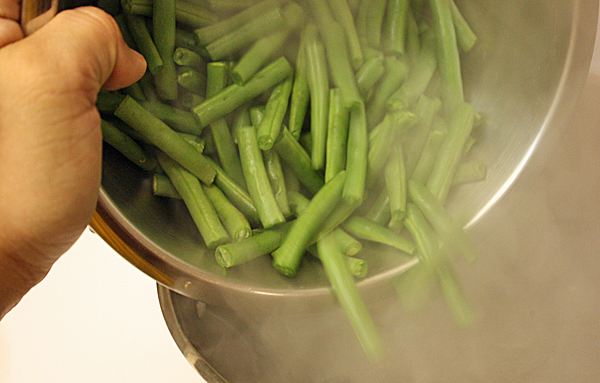 Start by heating a large pot of salted water to a boil so you can blanch the green beans and basil. Next, knock out the prep. Clean and cut 8 oz. of green beans into approximately 2-inch pieces. I hand selected my beans to be all a similar size, which made cutting them down easier later. 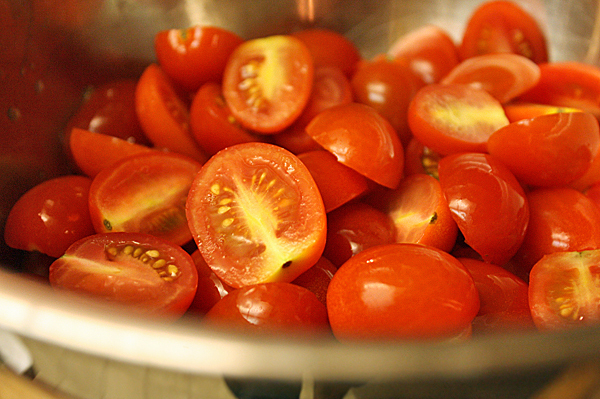 Slice 1 pint of cherry tomatoes in half and reserve. Create the spice mix for the chicken by combining 2 T of chopped parsley with 2 t of black peppercorns in a blender, food processor or Magic Bullet. Blend until the peppercorns are crushed and mixed well with the parsley. 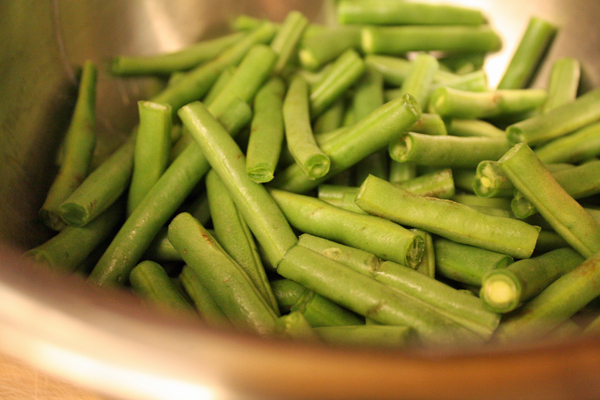 Drop the green beans into the water and let cook for 2-3 minutes. The beans will be cooked, but will keep their snap. Either cool down the beans in an ice bath or with cold water. Reserve. In the same pot, add the leaves from 1 bunch of basil and cook until they turn bright green, about 30 seconds. 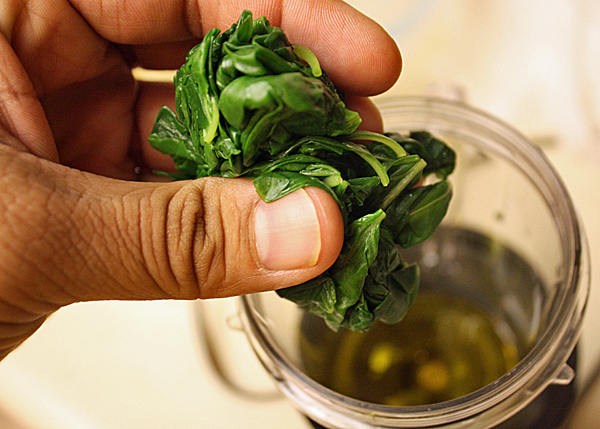 Pat the basil leaves dry and combine in a blender with 3 T of olive oil. Blend for 1-2 minutes, until bright green and smooth. Put in the fridge to cool for 15 minutes. 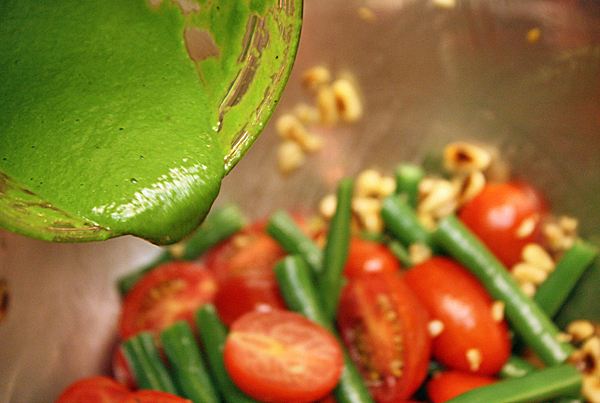 While the basil vinaigrette cools, heat a pan to medium-high and quickly toast 2 T of pine nuts. Mine are extra toasty because I heated the pan for too long before I put the nuts in. 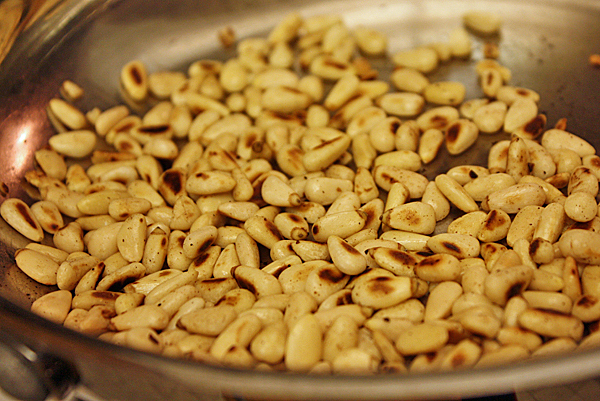 Remove the pine nuts, and in the same pan, add 1 t of vegetable oil. 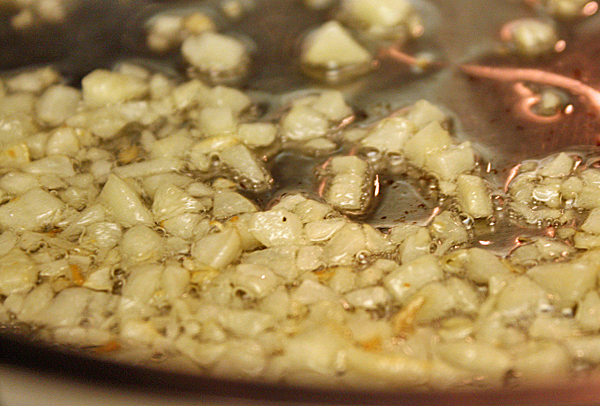 Chop 1 large clove of garlic and cook it until it starts to turn golden brown. Take the pan off the heat and let it sit. The residual heat will turn the garlic completely golden. Finally, shave 1-2 oz. 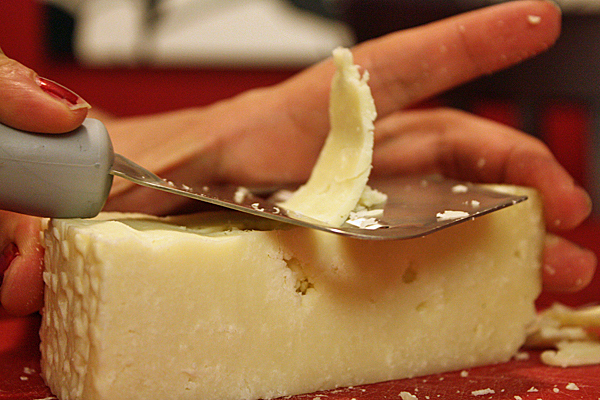 from a wedge of Pecorino Romano cheese. Butterfly the 10-12 oz. 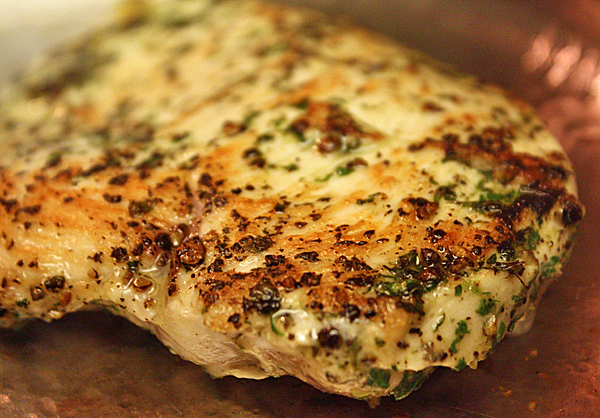 chicken breast and thoroughly pat both halves on all sides with the spice mixture. Heat 1 1/2 t of vegetable oil in a medium saute pan over medium-high heat and cook the chicken breast on each side for 3-4 minutes, until cooked through. 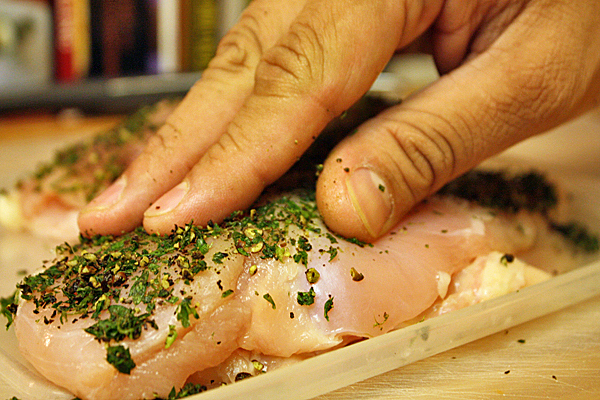 Allow the chicken to rest for five minutes before slicing. Grab the vinaigrette from the fridge and add 1 T of champagne vinegar, and season with salt and pepper. The reason we kept the vinegar out of it so far, is because it would have turned the vinaigrette dark, instead of keeping its grass-green hue. 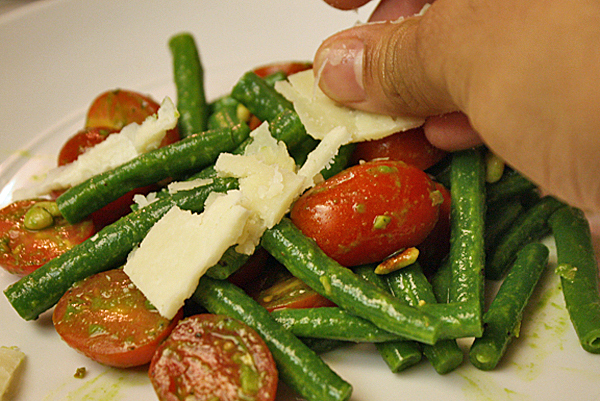 In a mixing bowl, toss together green beans, toasted pine nuts, cherry tomatoes and garlic. Season with salt and pepper. Add enough basil vinaigrette to coat, but be sure not to go overboard. To plate: Take your split of the veggies, sprinkle with your share of the cheese (I found it work better in thin shavings than thick ones) and top with sliced chicken. You’re ready to eat! 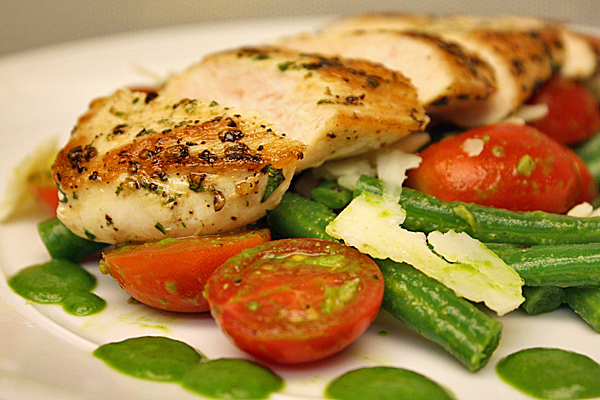 I’ve spoken a lot about the flavors, but truly this dish has a balance from the sweet-tart tomatoes, lemony basil, salty cheese and savory chicken. Winner, winner, for sure.